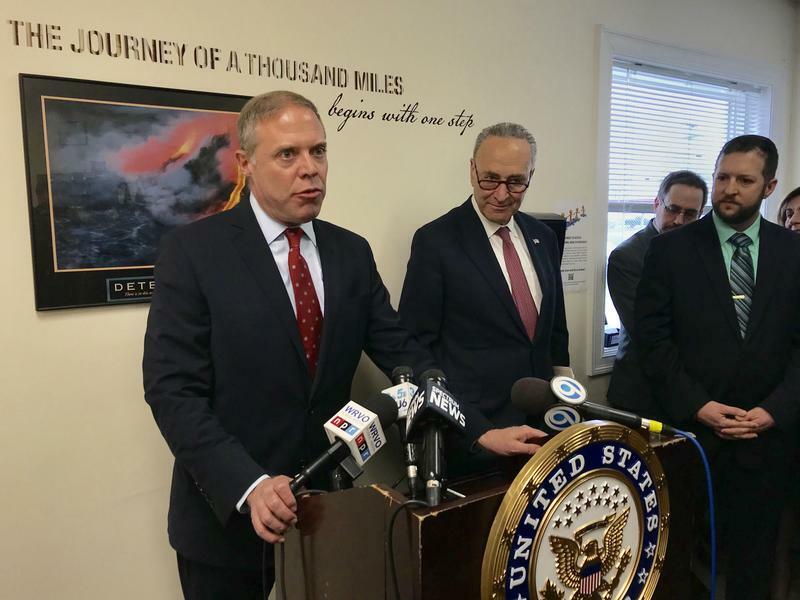 SYRACUSE, NY (WRVO) – Sen. Charles Schumer (D-NY) is calling on the federal government to release the funding that was included in Congress’ recently passed budget to battle the opioid epidemic. Lawmakers approved 6 billion over the next two years to help pay for prevention, treatment and law enforcement efforts to fight the drug epidemic. During a stop at a substance abuse and treatment clinic in Fulton Tuesday, Schumer said the funding has not yet made it to the local level. Farnham Family Services, a substance abuse and behavioral health clinic headquartered in Oswego, opened Oswego County’s first medically assisted treatment center to help wean addicts off of opioids last year. And the demand has been high. Due to limited resources, some are waiting up to four weeks for the treatment. Schumer said wait times at these facilities could be reduced with the new federal funding. Schumer says bureaucracy can often slow the release of federal funds, but time is of the essence in the opioid battle. According to the Centers for Disease Control, nearly 1,400 people died of opioid overdoses in upstate in 2016 – including 242 in central New York. During the visit, Schumer endorsed New York’s new fee on opioid manufacturers and distributors that was passed in the state’s budget. It’s intended to help the state keep up with the growing drug crisis. “The doctors, the pharmacists and above all else the manufacturers had a responsibility and the fact that there is a levy on the production of these drugs – as long as it goes to the right place like Farnham – I’m all for it,” Schumer said.